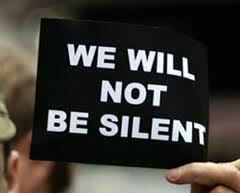 Esther Wrightman says she’s not about to be silenced in her fight against wind turbines in her community. 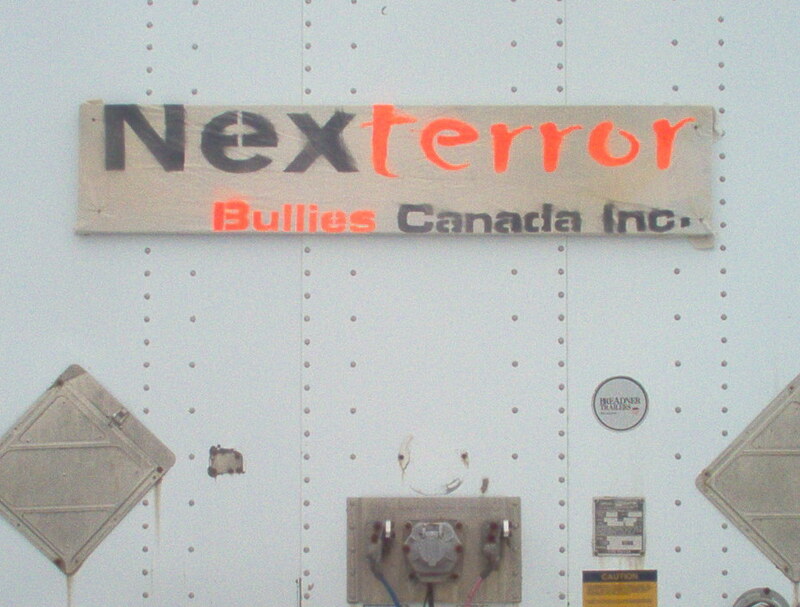 Wrightman, a member of Middlesex Lambton Wind Action Group, recently received a Cease and Desist order from NextEra Energy after altering the company’s logo to make it read Next-terror and NextError on signs and videos. 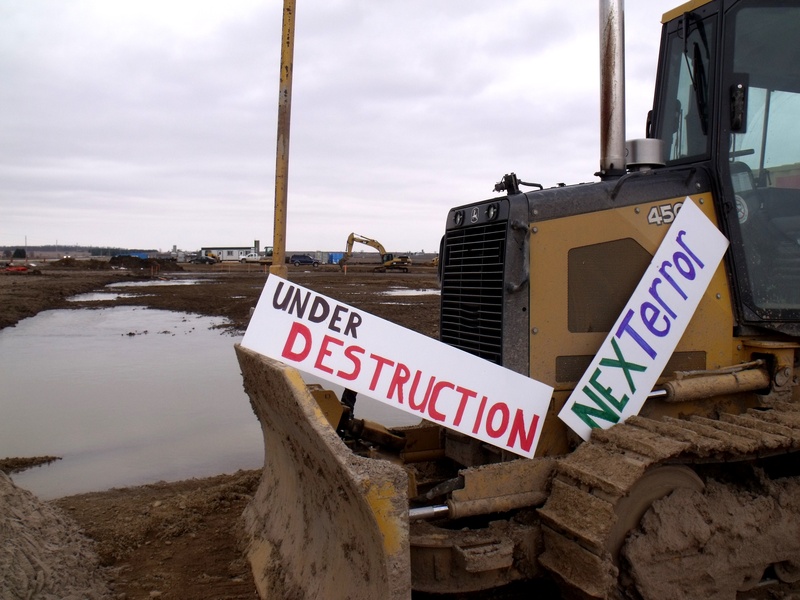 “Cease & Desist” for NexTerror Energy? No thanks. Thank you for the letter dated March 20, 2013 that was dropped between my doors the other day. 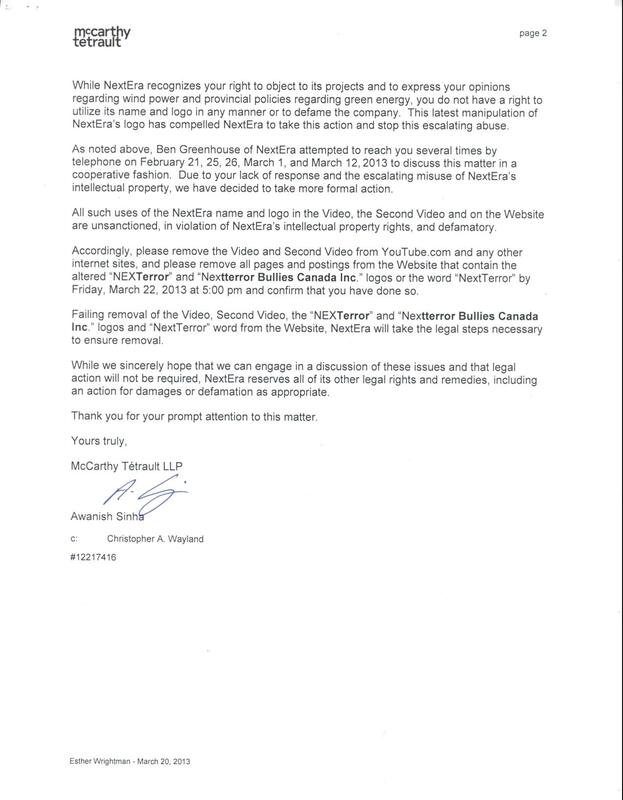 The reason I (and “we” the communities in rural Ontario) are referring to your client Nextera as “Nexterror”, is that we feel it is “fair comment” considering this companies actions and behaviour in the past and present in our communities. 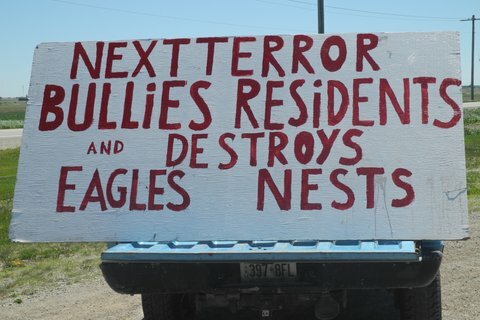 We believe that Nextera creates “errors” and “terrors” in our community, and that these facts are well known to the public and therefore these facts are notorious. 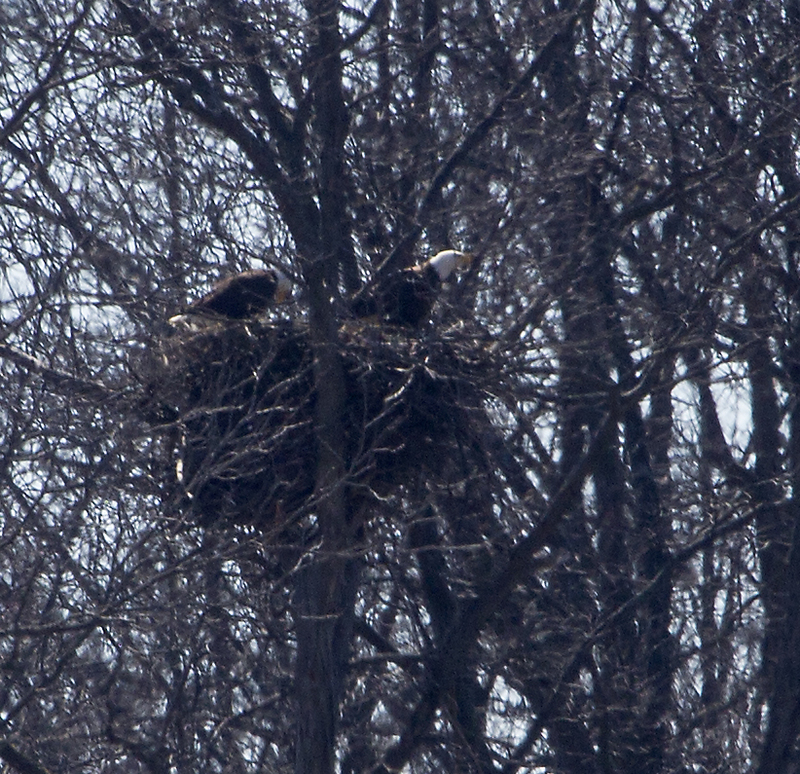 -The “First Video” clearly shows the destruction of an eagles nest. 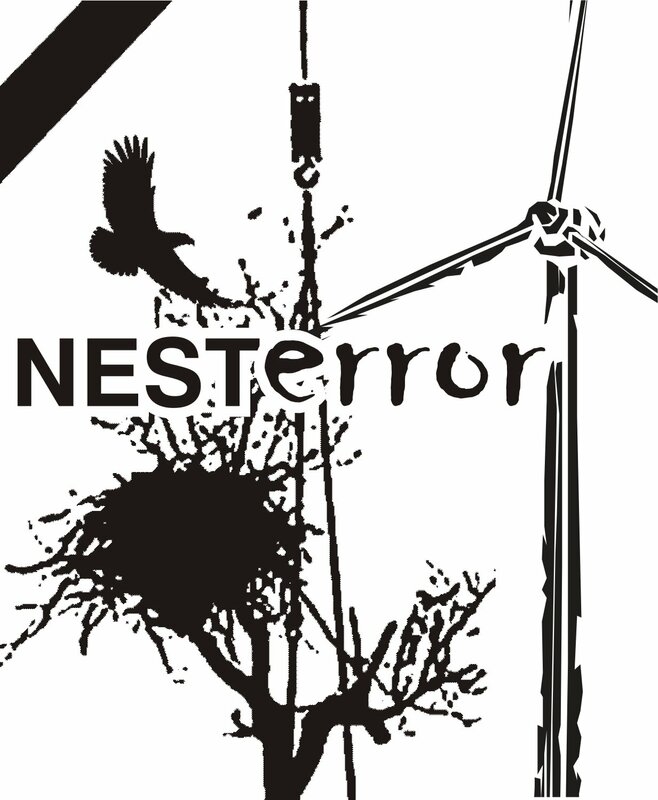 -The “Second Video” shows Tom Bird of Nextera saying, “The authorization we got from the ministry of natural resources was to destroy this nest”. 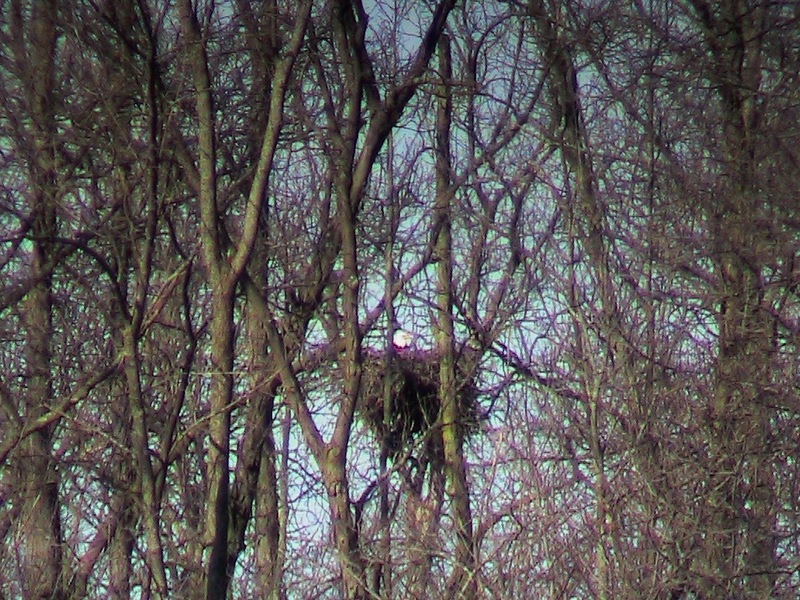 Clearly this is terrorizing the community when 18 men with chainsaws and bulldozers descend on, and proceed to cut down an active eagles nest. 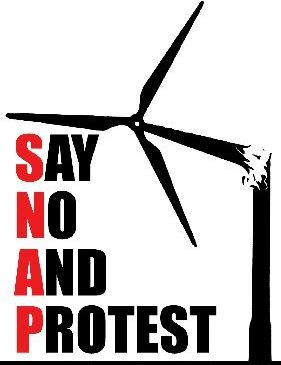 Even those in favour of turbines are horrified by this despicable action. You have no right to ask that these movies be removed, and in fact you did not give a single reason as to why you thought the “Second Video” should be removed, as “Nexterror” does not appear on it anywhere. It seems that Nextera would just like to bury this incident and remove the evidence from Youtube. 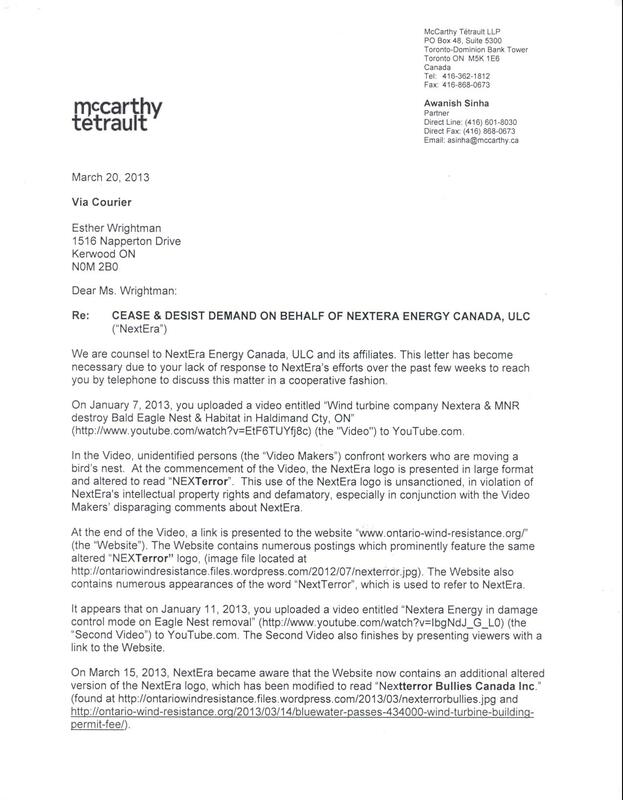 Nexterror Energy sent me a ‘cease and desist demand’. What would you do? CTV News: Could wind developments impact tundra swan visits? 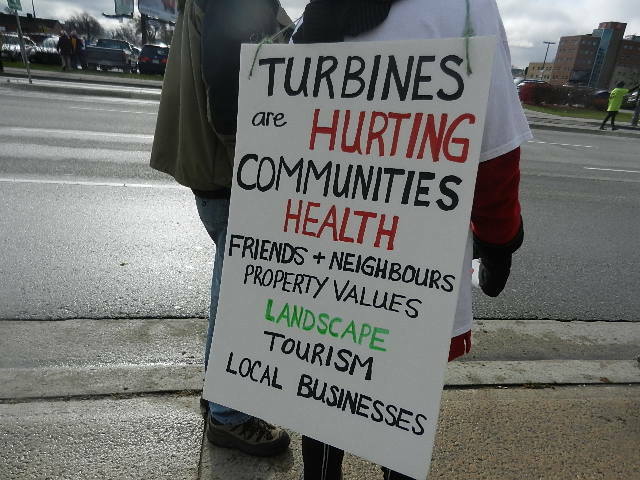 GRAND BEND — About 70 people were in attendance at a protest Sunday of the planned installation of wind turbines in or around the Thedford Bog near the Lambton County Museum. At issue is the tundra swans that use the bog to rest and feed on their way from their wintering grounds in Chesapeake Bay to the Arctic shores breeding grounds. 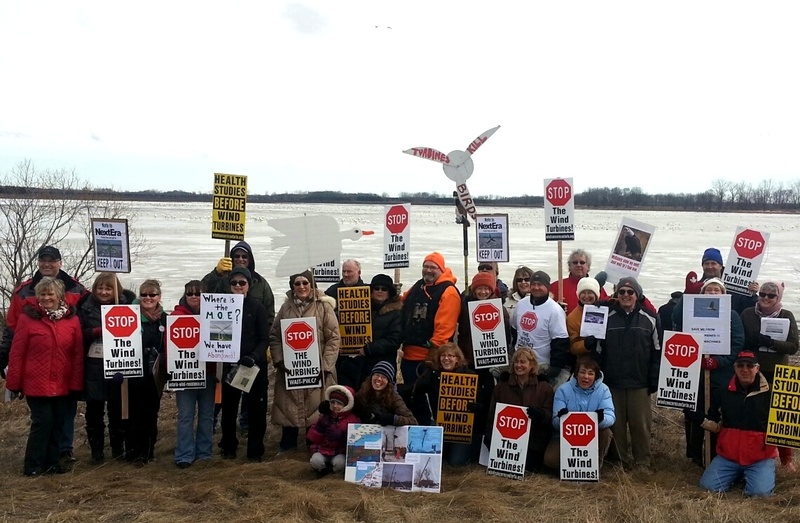 Protesters believe that building turbines in the bog will disrupt the flight path of the swans and they will disappear from the area and never return as long as the turbines are in place. Muriel Allingham is questioning why the Ausable Bayfield Conservation Authority would allow wind energy companies to survey sensitive areas such as Rock Glen Conservation Area. 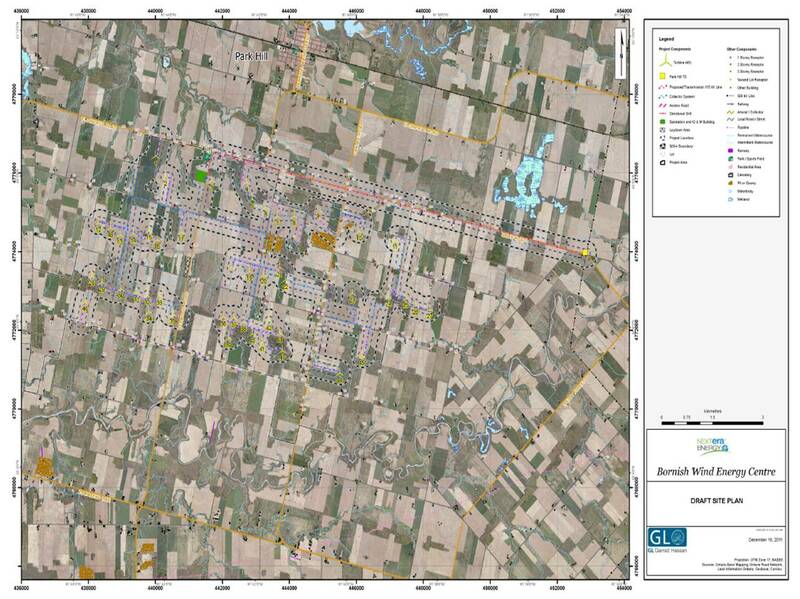 Documents released by the authority released to Allingham, a member of Middlesex Lambton Wind Action, show a company called CanAcre, working for NextEra Energy on the Goshen and Jericho projects in Lambton and Middlesex, signed an agreement with the ABCA to have access to conservation land for field studies. 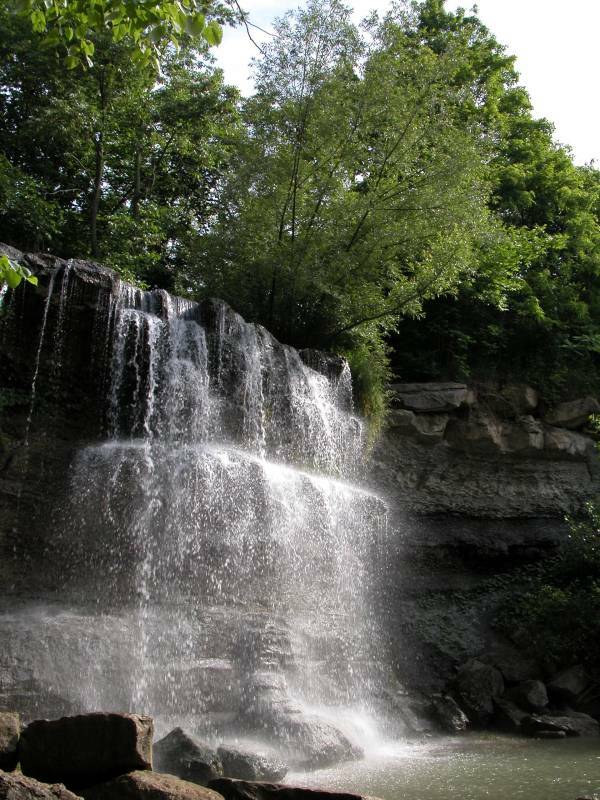 Rock Glen Conservation Area in Arkona was among the nine tracts of land surveyed. 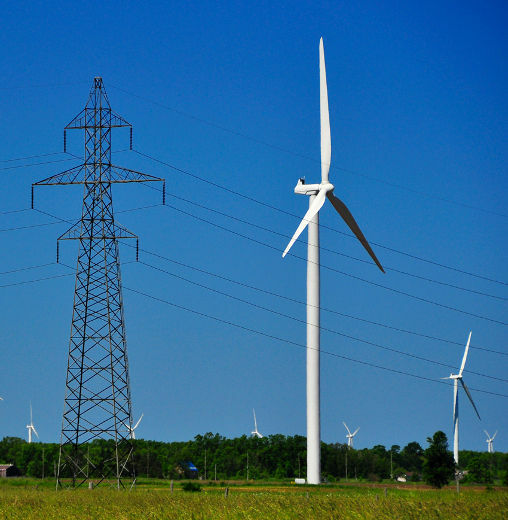 Two subsidiaries of NextEra Energy Canada have applied to the Ontario Energy Board for leave to construct electricity transmission facilities for their proposed wind farm projects in Middlesex County. 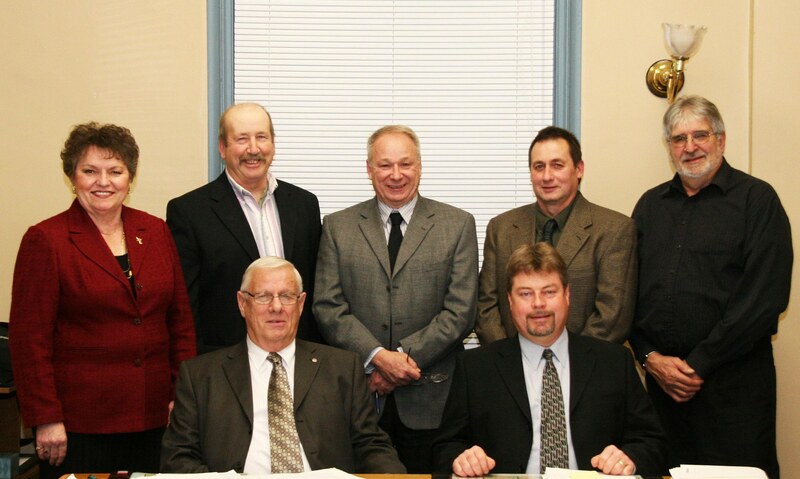 The applications were submitted to the OEB Feb. 8 and in anticipation of an upcoming hearing to allow the public and other agencies to express interest, county councillors at their bi-monthly meeting Feb. 19 in London gave Middlesex County staff permission to intervene on their behalf. President Obama likes to talk about making sure “the biggest corporations pay their fair share.” Treasury secretary Tim Geithner calls for tax reform to close loopholes and subsidies. Budget hawks say federal spending must be curbed. Congress and federal environmental regulators claim they are doing everything they can to save endangered species. By doing nothing and waiting for December 31 to pass, all of those folks could strike a blow in support of each of these policies. All they have to do is let the federal production tax credit (PTC) for wind energy expire on schedule this coming Monday. 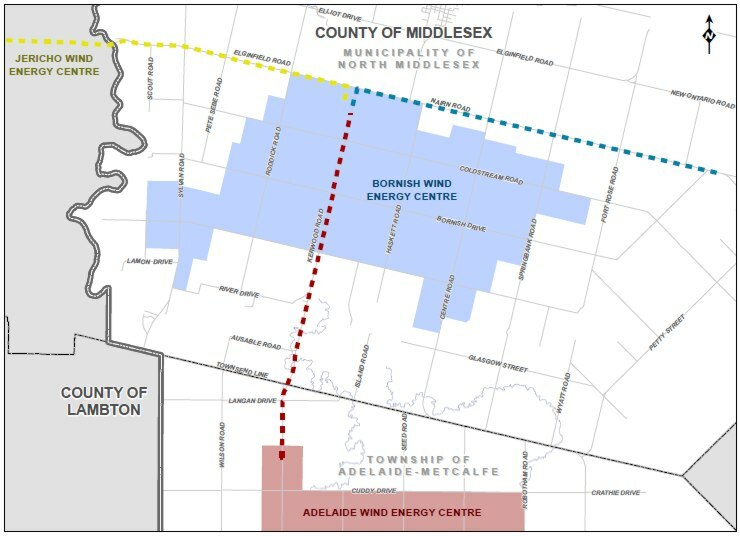 The Municipality of North Middlesex is hosting a public information meeting regarding proposed wind turbine projects. The Liberal party, engaged in a collective effort of navel-gazing, is puzzled as to why rural residents have such irrational fear of the great green future planned for them – all the prospective leadership candidates affirm that the wind energy program will proceed as planned. North America’s largest wind energy company generated local static Tuesday as it asked Middlesex County to smooth the process in allowing transmission lines along county roads. 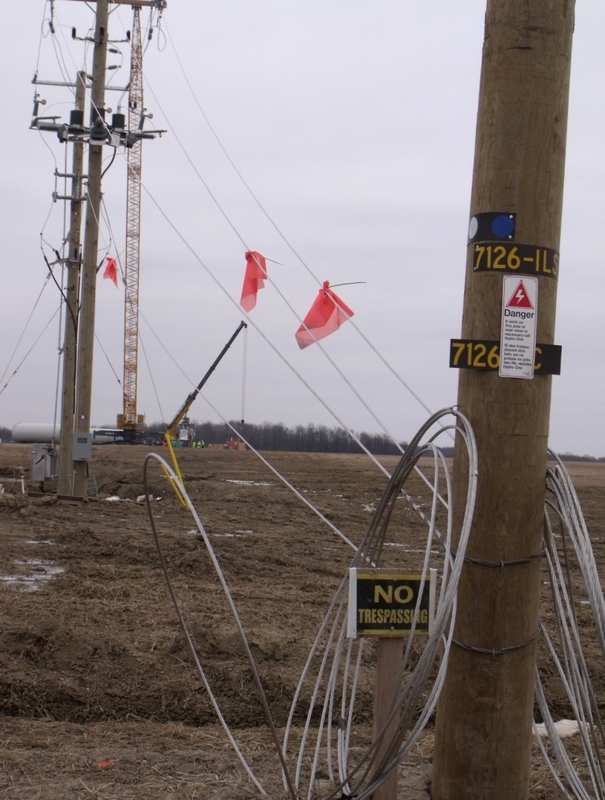 The transmission poles would connect NextEra’s three proposed wind farms near Thedford, Parkhill and Strathroy along county-owned roads. 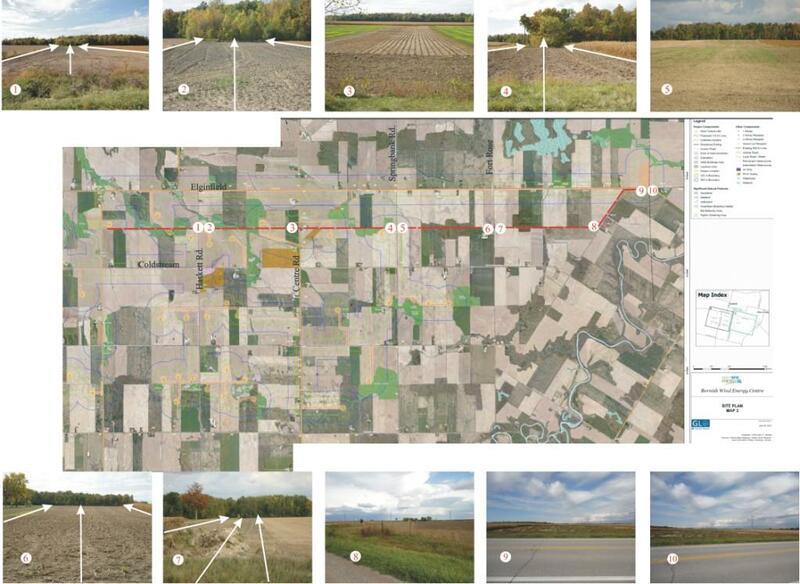 County councillors expressed concerns about the poles’ height — each would be about 35 metres tall — possible conflicts with other services, such as drainage and hydro, and clearance at intersections. Southwest Middlesex Mayor Vance Blackmore wondered if they would exacerbate worries that Middlesex roads already have too many signs and poles. But he conceded the county is required to share its rights-of-way and needs to make sure policies are in place to protect county interests.